For collectors and investors who understand the importance of owning silver, PAMP Suisse Silver Bars offer amazing quality, lasting value, and one the world’s most recognizable styles of silver bars. 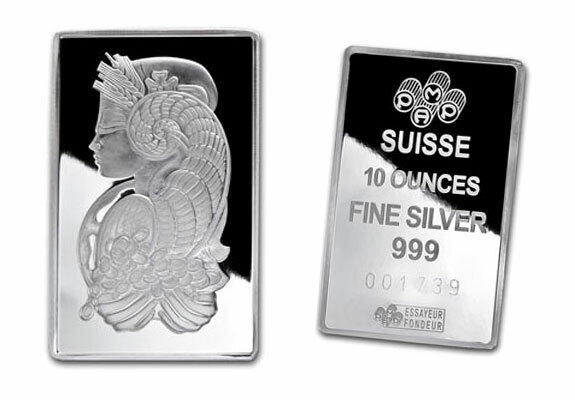 Many PAMP Suisse Silver Bars have one iconic motif – the goddess Fortuna. The obverse (front) side of most PAMP Suisse Silver Bars showcases the Lady Fortuna design that has become a world-renowned sign of quality and authenticity. The goddess of fortune and prosperity is portrayed with attributes such as sheaves of wheat, a horn of plenty, and precious coins. The reverse (back) side displays the PAMP logo, the weight, and the words “Fine Silver”. These bars are assayed and guaranteed to be of a .999 fineness level as clearly displayed on the bar. PAMP stands for “Produits Artistiques Métaux Précieux”, or “artistic precious metals products” in English. Established in 1977, PAMP is one of the world’s leading bullion brands. With services including precious metals pricing, physical trading, and daily market reports as well as clients ranging from central banks and government mints to bullion retailers, it’s easy to see why PAMP produces only the highest of quality products. The design pictured above is the most common for PAMP Suisse Silver Bars. They are minted in other designs as well; since 2011, PAMP has been producing gold and silver bars in its “Lunar Calendar Series”, the latest in the series being the 2015 “year of the goat” edition. PAMP Suisse Silver Bars are some of the most iconic forms of silver you can own, however beyond the technical specifications and value there are other reasons to own silver. Precious metals such as silver have long been considered a safe haven against inflation. Traditionally, as the value of currencies has fallen, investors have turned their assets into gold and silver in effort to ensure their wealth is protected. If you have children, silver may be the perfect vessel to help them understand the importance of saving and investing. You may not be too eager to place a gold bar in the hands of a 10-year-old, but a single piece of silver may not be so intimidating. Chances are your children will inherit your estate one day. By placing a tangible piece of silver in their hands today, the heirs to your wealth can begin to grasp the importance of saving and investing. For more information about adding PAMP Suisse Silver Bars to your Silver IRA, tax-free and hassle-free, call American Bullion at 1-800-326-9598 to speak with a specialist.